"Pizza was never easier than this--spread the sauce, pepperoni and cheese on pizza batter and bake for 30 minutes for a savory, deep-dish treat." Top dough with pepperoni slices. Firmly push pepperoni into batter. Sprinkle with cheese. Bake by placing in a cold oven; set temperature to 350 degrees F. Bake for 30 minutes or until done. 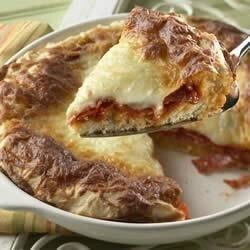 If using large pepperoni slices, cut each slice in half or quarters for easier serving. If desired, batter may be mixed in a separate bowl. Proceed as directed above. Too wierd of a crust for us. Loved the idea, just not how the dough cooked up. Easy, delicious lunch for my kids. They all loved it. I baked in a springform pan and it came out wonderful!